Whenever I travel, the usual text messages I send home to my parents are “about to board” and “just landed.” I’m not really one for sending SMSes — I would rather send photos and let them see what I see. Picture messages or MMS is rather pricey to send and to receive, so this is a problem if I want to send to many. 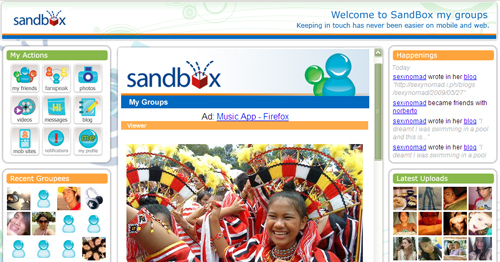 Luckily, there’s Sandbox, the newest social networking site. Sandbox is an online platform that allows anyone to connect with friends and share blog posts, photos and videos. Apart from this, Sandbox is also an online content store where you can buy music and games. So what sets it apart from other social networks? Sandbox is also locally developed and thus there is a continuous stream of offline fulfillment through giveaways, raffles and prizes. In other words, Sandbox is in the business of building communities because not only is there interaction between your friends, there is also conversation between the developers and the users. In marketing terms, it isn’t just horizontal exchanges between consumers, but also vertically, where the product talks back and gives value to insights and suggestions from the community — alongside promotions and giveaways! With Sandbox, sharing photos on the road just got easier. Just snap, write a short caption and send to upload@mysandbox.com.ph. When you’ve uploaded your photos, it’s now viewable online for all your friends and family to see. Now isn’t that convenient? You can join Sandbox by registering at www.mysandbox.com. Note: I was one of a number of bloggers who beta-tested the site. It is still on its beta-run, so user feedback on its system is greatly appreciated by the Sandbox team. At least the interface is catchy.